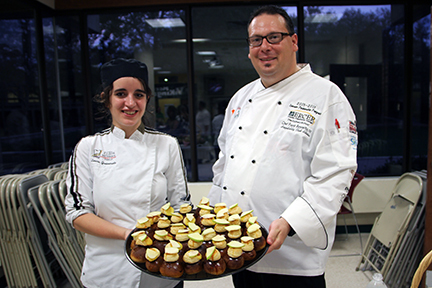 Laure Granarolo, last year's winner of the Chef Anne Lumberger and Chef Shari Widmayer Pastry Arts Memorial Scholarship, shows off her winning original apple caramel dessert during last year's culinary tasting event, with MCCC Culinary Instructor Chef Frank Benowitz. Sample the winning dessert at this year's event! WEST WINDSOR – A feast for the eyes and the palate is in store for Central Jersey food aficionados during a culinary tasting event hosted by Mercer County Community College’s (MCCC) Culinary Arts program, featuring more than a dozen of the region’s finest restaurants. This third annual event will be held on Wednesday, Oct. 12, from 6 p.m. to 8 p.m. in the MCCC Cafeteria, 1200 Old Trenton Road, West Windsor. In addition to food prepared by area restaurants, MCCC Culinary Arts students – both current students and alumni – will be staffing tables and giving participants the opportunity to see them in action. Headlining the event include tasting tables staffed by Agricola and Terra Momo Bread Company of Princeton, and the Blue Bottle Café of Hopewell. Other participating restaurants include Ravello by Toscano, Robbinsville; Jersey Girl Café, Hamilton; EnoTerra, Kingston; Palace of Asia, Lawrenceville; Wegmans, Nassau Inn, Small World Coffee and Trattoria Procaccini, all of Princeton; and Stone Terrace by John Henry’s and Jersey General Salsa, among others. The evening will also feature a silent auction, with many holiday gift items available. Tickets are $35 for MCCC alumni, students, faculty, and staff; general admission is $50. All proceeds from the event will benefit the Chef Anne Lumberger and Chef Shari Widmayer Pastry Arts Memorial Scholarship Fund. Tickets can be purchased at MCCC’s Kelsey Theatre box office, or purchased online through the Kelsey Theatre ticket portal here.